Osborne’s AGRI-AIDE elbows have been specifically designed to be used as a weatherhood for exhaust fans. Elbows are smooth, inside and out, with a non-porous surface composed of Osborne-engineered RTM-Glas fiberglass-reinforced plastic. The non-porous surface minimizes accumulated dust. 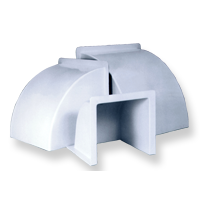 The versatile line of elbows adapts to many fans and can replace many outdated, corroded metal weatherhoods. RTM-Glas elbows do not become brittle in the cold like other, cheap plastics, and it holds its shape in the heat of summer. Thus, it will not heat sag like some other plastics do.For detailed specifications and measurements, please contact Osborne Customer Service.